We have selected best 20 free 3d model websites in 2018. 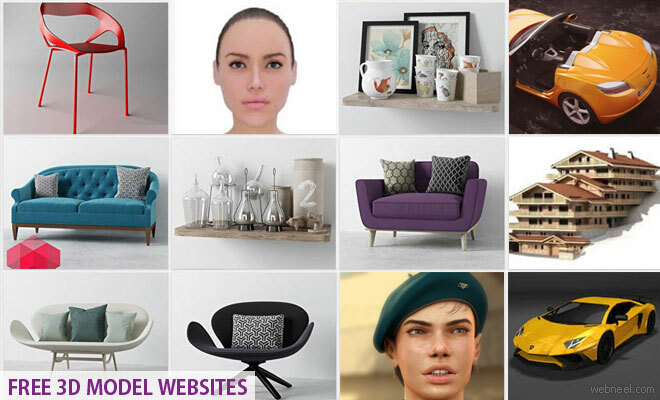 Enjoy the amazing collection of free 3d model websites. You now access 1000's of royalty free 3d models which are listed under various categories for your creative projects. Some of these websites allow you to edit the 3d models online, which is a wonderful idea. Apart from free 3d models, you can access CG Textures, Rendering images and CAD Files which can be used for 3D printing purposes. 3DXO is a project of xyberdyn.com and was started in 2001. Since the founding of this web site it was always our goal, 3D interested users a wide range of high-quality 3D content and resources to offer. We do not want be the quantitative greatest 3D Portal/Directory on the Internet. We want to be the best 3D Portal/Directory or we will work on it. CGTrader is one of the leading 3D model marketplaces globally with 1,500,000 users and over 690,000 3D models for computer graphics, virtual/augmented reality and gaming. Since 2005 Hum3D helps 3D artists from more than 80 countries save their time and create stunning works in the field of cinema, video games and visualization. At our store designers can find 3D models of any epoch. TurboSquid models are used by game developers, news agencies, architects, visual effects studios, advertisers, and creative professionals around the world. 3DExport is a marketplace where you can buy and sell 3D models, 3d print models and textures for using in CG projects. Our 3D Models marketplace was launched in February 2004, and now we are one of the world's largest providers of high quality 3D content. Enjoy the vast resource of 3D Models which are free to use. Have fun. Free3D is the place to share your 3d models with the world. Build your own portofolio to show your skills and get freelance work: keep an eye on the inbox! Design Connected was started back in 2006 by two architects who wanted to bring more realism in the world of interior design 3d visualization. 3dsKY is an amazing platform, where you can access exciting free stuff for 3d models. You can choose from a variety of categories. Sweet Home 3D is an application that helps you place furniture on a house 2D plan, with a 3D preview. You can build your own 3d models using this website. Time to explore and become creative. Only Adobe gives everyone, from emerging artists to global brands,everything they need to design and deliver exceptional digital experiences. CADnav is the online 3D Models Library for CGI graphic designers and CAD/CAM/CAE engineers, we are providing more than 50000+ Free 3D Models & CAD Models download. Remix 3D is an offspring of Microsoft. You can access many free 3d models for every occasion. You can access Nasa 3D Models of satellites, rockets and more.